These pages are for historical and informational purposes only. We offer the names and terms of all Countywide elected officials since the beginning of the County, in 1874. 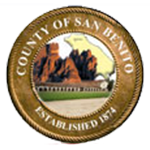 San Benito County was formed in 1874 with only 3 Supervisor districts. In 1883 the California Legislature adopted chapter 75 to establish a uniform system of county and township governments. Section 13 of the chapter provided for a county board of supervisors consisting of five members. Section 16 required each board of supervisors to district its county into five supervisorial districts as nearly equal in population as possible. As a result the county was redistricted into 5 Supervisor districts. Some offices have come and gone, or have been merged with others, and we attempt to show the history of this as well. If anyone finds an error on these pages, please feel free to bring it to our attention by contacting us at SBCVote@cosb.us. Additionally, any photos of these elected officials that you care to share with us, would be greatly appreciated. For additional offices, please use your browser back button, or select from the options in the menu to the right (or below if you are using a mobile device).